“Facebook, Instagram, Twitter? I use that everyday. Who needs to be trained in it?” Young Employee sentiment like this has quickly become the stuff of nightmares for companies and employers today. Why? Well, because somebody who grows up being a social media native, doesn’t make them an expert in using social media at work or getting a job. While businesses are racing head-on into the social media arena, the contemporary young workforce is still seriously ill-equipped to help unlock its value. And that value is simply enormous. The Social Media Savvy (SMS) Partnership will plug in this young social human capital ! The SMS Partnership will take young people on a interactive and challenging journey of social media creativity; enhance their digital skills, personal branding and presentation skills. The idea is that this partnership will make it easier to progress into work. They will create a workshop targeted on young people still in school (potentially to graduate within 2 years) and/or or recent graduates (age 14-24). The idea is that all those young people have a lack of work experience, but have a lot of smartphone experience. So the only thing they do have is their own personal brand. A professional digital identity is the first step to gain any kind of formal work experience which will lead to a substantial improvement of career development. In this workshop to be developed SMS will help them to apply their smart phone experience on Facebook, Twitter, etc. in connection with the world of work. So, smartphones allowed! 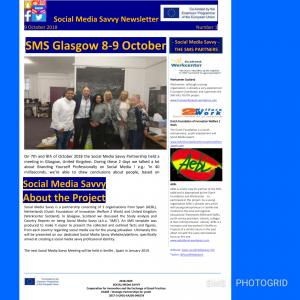 We believe that opening up this method to synergies of SMS partners will lead to a attractive Social Media Savvy Programme, developing a transnational social media savvy identification and support programme targeted at young people aged 14-24 & possibly their teachers & trainers. How to spot, identify and support a Young Person (aged 14-24 and NEET 16-24) social media savvy? How can we identify & support the professional social media ’mindset? How can we provide all the support materials to young people, teachers & trainers? To provide young people, teachers and trainers support in their “Social Media Savvy Journey” is complex & requires discipline & motivation from all actors involved. Successful practices have emerged from different places & examples. We will run, test and fine tune a Social Media Savvy Programme with young people & for young people during the project period 1/3/2018 – 1/3/2020. This will show that progresses is being made every day on the field. SMS aims at acting at different levels upon young people, educators, processes and tools that mediate support, in order to give leverage, propose sustainable innovations, and promote the sharing and appropriation of innovative entrepreneurial practices across Europe.